Although children from wealthier families outperform children from poorer families on achievement tests, a new study from Mathematica Policy Research finds that teachers of low-income students are nearly as effective as teachers of high-income students, on average. The two groups also have similar chances of being taught by the most and least effective teachers. In addition, teacher hiring and mobility patterns are consistent with small differences in access to effective teachers. The study, sponsored by the U.S. Department of Education’s Institute of Education Sciences, assessed low-income students’ access to effective teachers in grades 4 through 8. It examined 26 school districts nationwide over a five-year period. “Contrary to conventional wisdom, we found only small differences in the effectiveness of teachers of high- and low-income students in our study districts. This suggests that the achievement gap arises from factors other than students’ access to effective teachers,” said Mathematica Senior Researcher Eric Isenberg, the principal investigator. Details are available in the study snapshot, executive summary, and full report. Measuring teachers’ effectiveness in improving student achievement, Mathematica’s researchers found that in both math and English/language arts, the average teacher of a low-income student is just below the 50th percentile, while the average teacher of a high-income student is at the 51st percentile. 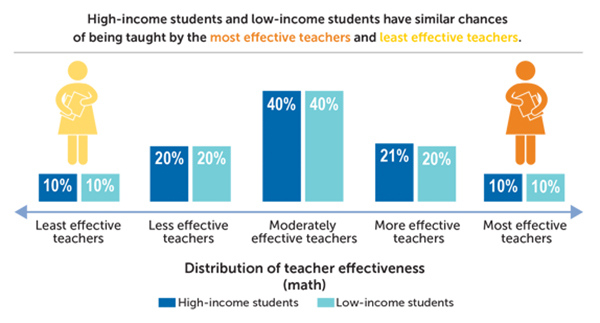 In addition, low-income students are just as likely as high-income students to be taught by the most effective teachers. Low- and high-income students are also similarly likely to be taught by the least effective teachers. In 3 of the 26 districts studied, differences in teacher effectiveness for high- and low-income students were large enough to meaningfully contribute to the existing student achievement gap in math. The study did not find evidence of meaningful inequity in the other 23 districts for math, nor in any districts for English/language arts. High-poverty schools have more new hires—defined as teachers new to the district—than low-poverty schools. However, this difference likely has only a small influence on equity in the study districts because relatively few teachers are new hires, and the performance of new hires improves quickly. The teachers hired into high-poverty schools are equally effective as those hired into low-poverty schools. Teachers who transfer to schools in a higher poverty category are less effective than those who transfer to a school in a lower poverty category. However, this also should have only a small influence on inequity because just under four percent of all teachers transfer to a school in a higher or lower poverty category. Teacher attrition patterns do not contribute to differences in the effectiveness of teachers of high- and low-income students. This study advances Mathematica’s work on access to effective teachers for low-income students and contributes to the broader evidence base on teacher and principal effectiveness. Listen to Mathematica's "Policy in Perspective" podcast on this study. Policy in Perspective: Who Has More Effective Teachers?